We started making this easy recipe when our whole family went on a gluten-free, sugar-free, dairy-free, no-preservative diet. We were trying to eat this paleo diet (like the paleolithic times!) to see if it eased my daughter’s eczema. Unfortunately, it didn’t really help her symptoms much and she still had a lot of itching and dryness. On the plus side, we felt great, it made us eat a ton of vegetables and healthy foods and cut out a lot of unnecessary junk in our lives. Nowadays, we still eat pretty healthfully and I make shephards or cottage pie (or turkey) every few weeks or so. 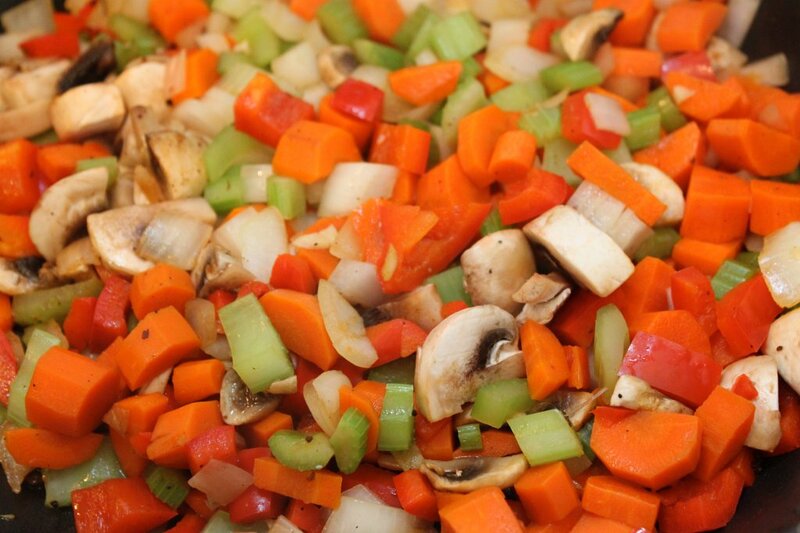 Its such an easy way to get a lot of veggies in a dish and its easy to prep in advance, most likely during a nap time. It also has such a homey, filling quality to it. I hope you enjoy it as well! 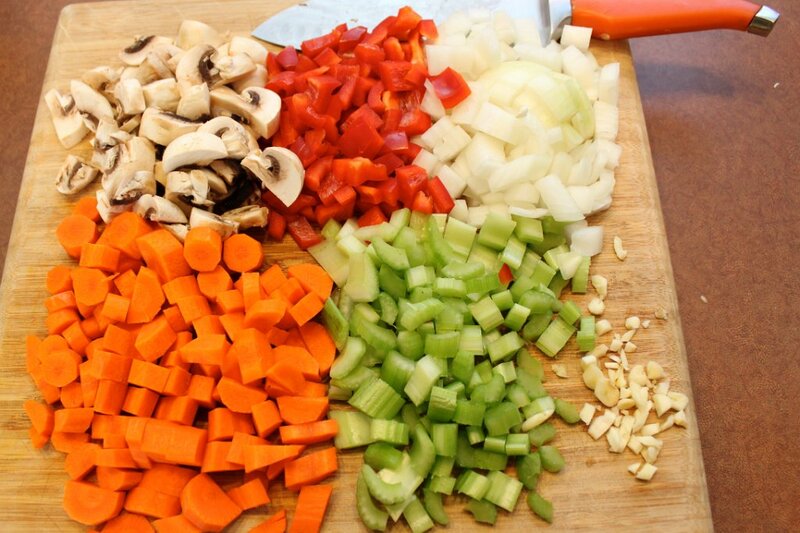 There is a lot of chopping involved here, but it really makes the dish super hearty and delicious. It’s something I feel really happy about feeding to my family 🙂 You can always do that step in advance and store until you are ready to cook. Unfortunately, I didn’t have my special helper this time. 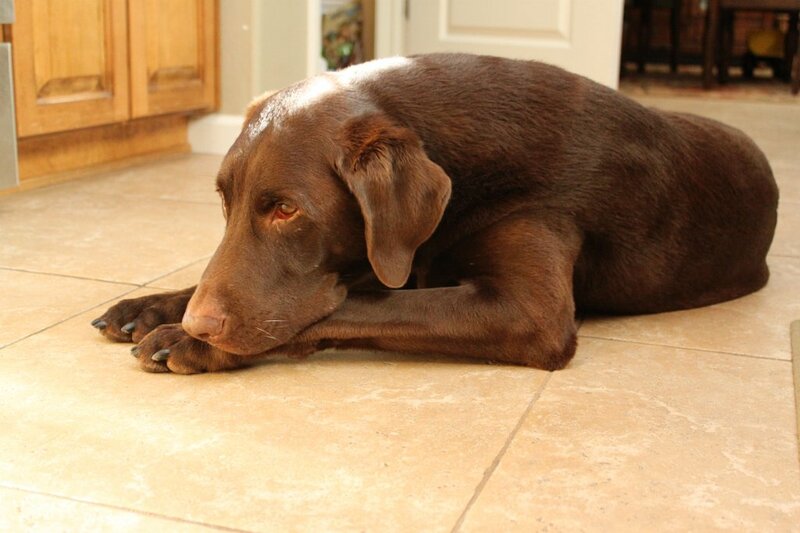 Waiting for any dropped food! Preheat oven to 400 degrees. Peel and cube sweet potatoes and place in boiling water to steam 10-15 minutes, until fork-tender. (*FYI I roasted my sweet potatoes the day before for 1 hr in 375 degree oven wrapped in foil and then cooled and refrigerated overnight). 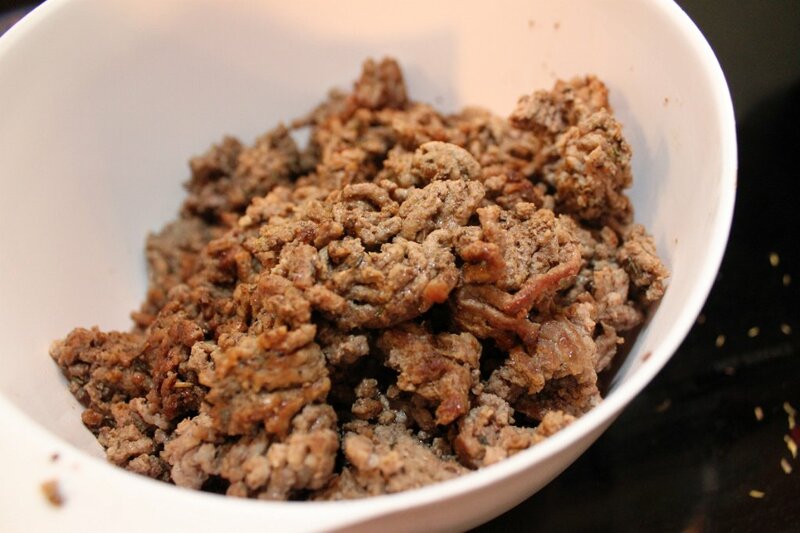 Start filling by browning meat in large skillet and seasoning with salt and pepper and all herbs. Remove to another dish, leaving any fat in pan and set aside. 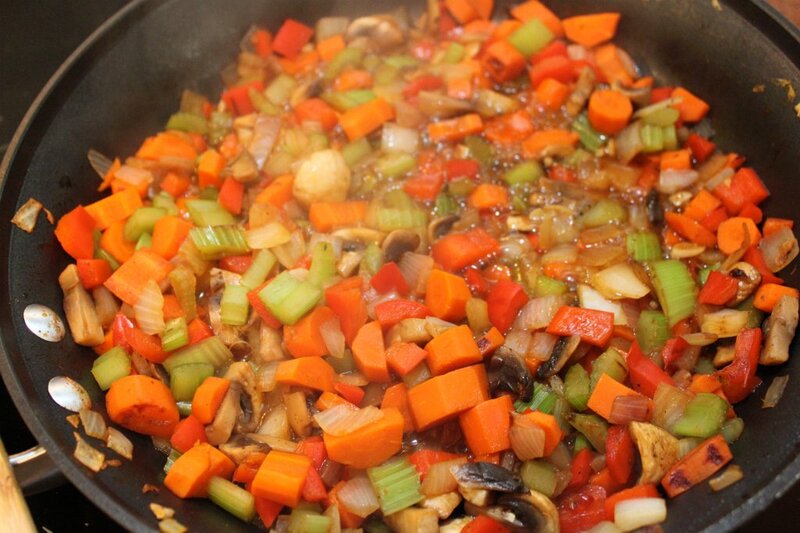 Chop veggies: onion, celery, carrots, mushrooms, red pepper and garlic. Add to skillet on medium low heat until softened, about 10 minutes. Add salt and pepper. 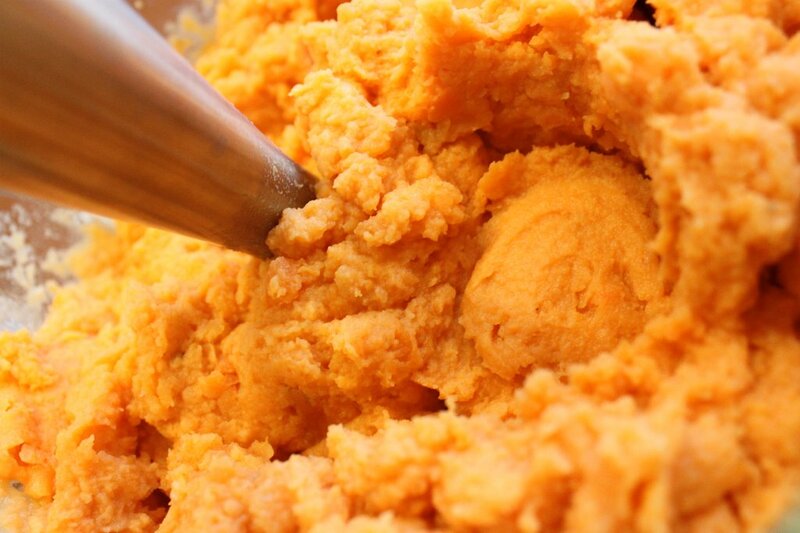 While veggies cook, remove sweet potatoes and mash. (I use my immersion blender, it’s awesome!) Add garlic and onion powder, milk and 1/3 cup of chicken broth, salt and pepper. Mix thoroughly. 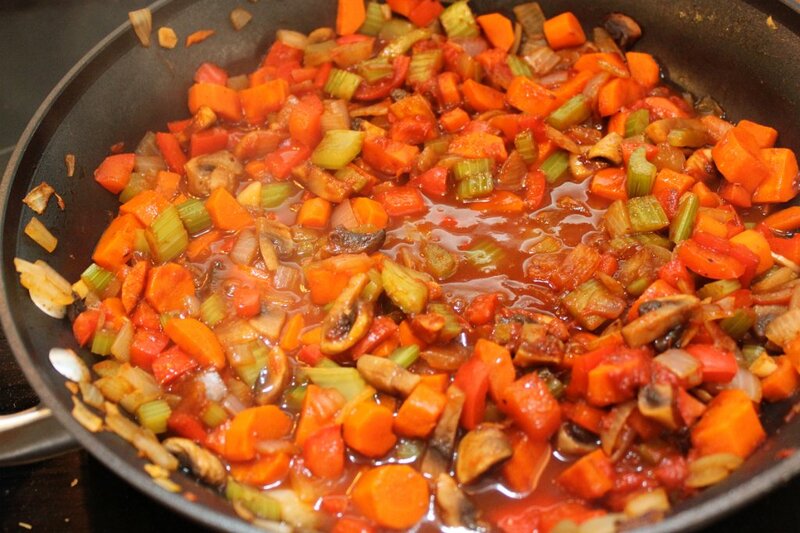 Add 1/4 cup of chicken broth to veggies and scrape up any bits on bottom of pan. 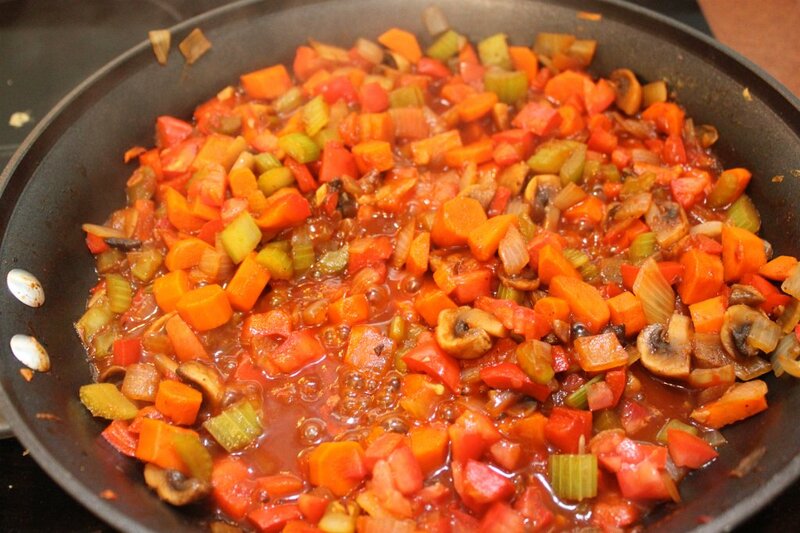 Chop tomatoes and add to veggies. Add tomato paste and worcestershire, continuing to stir. Add another 3/4 cup of chicken stock and bring to simmer, 1-2 minutes. Return beef to pan and stir to incorporate. 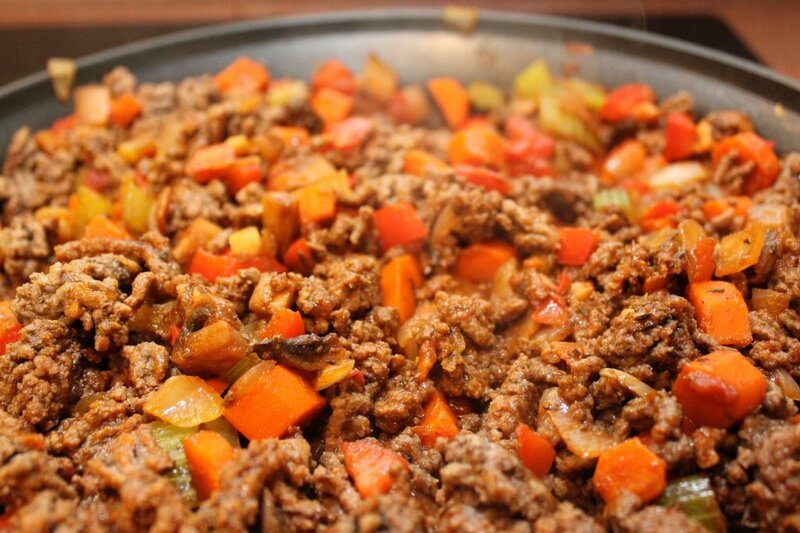 Add beef and veggie mix to 9 by 11 in pan. I find it helpful to press everything down with my spatula to even-out the filling. 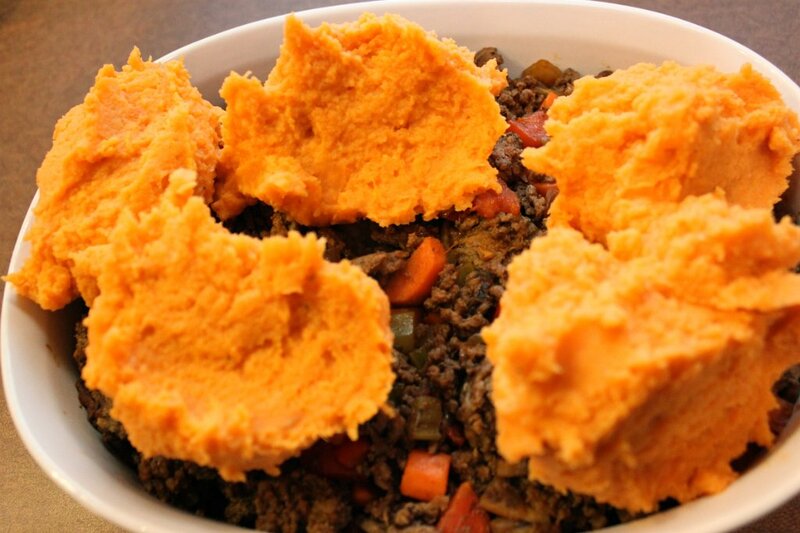 Mound sweet potatoes by the spoonful atop the beef filling. Grate parmesan cheese all over top. 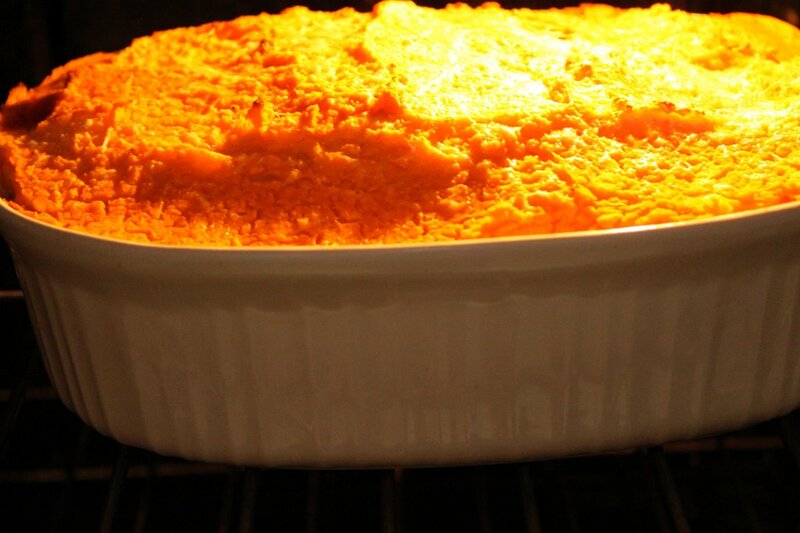 The dish can be covered and put in refrigerator if need be or placed directly in oven, uncovered for 30-40 minutes. I like to broil the top for the last 2-3 minutes to get cheese really melted. Let stand for 5 minutes, then dig in! 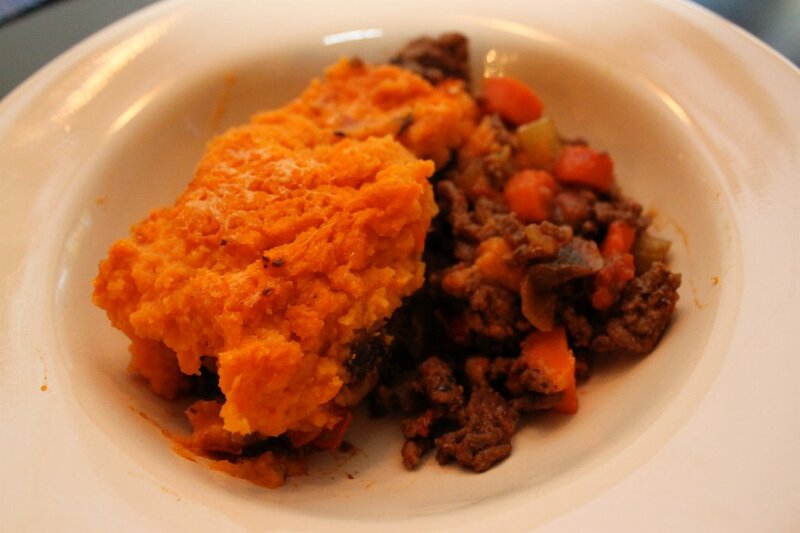 Please let me know what you thought of the Sweet Potato Cottage Pie! I would love to hear from you! 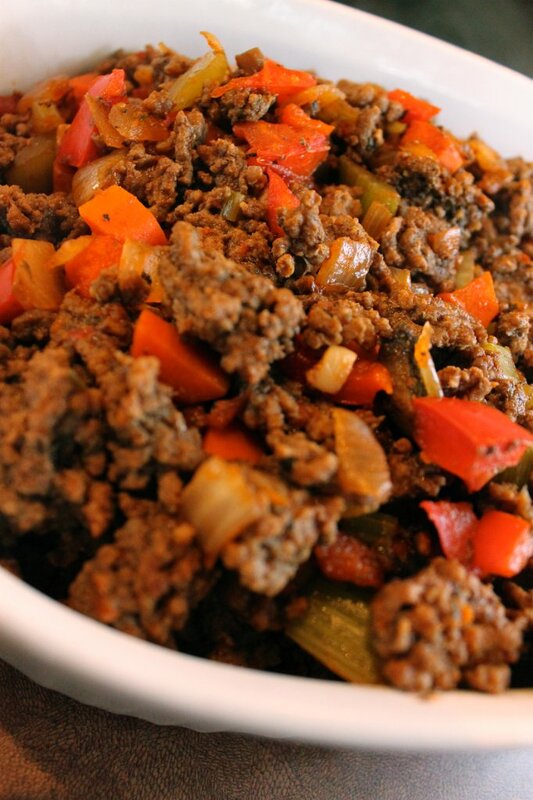 I had a package of ground beef in the fridge that I hadn’t decided what to do with yet and this recipe was the perfect thing! 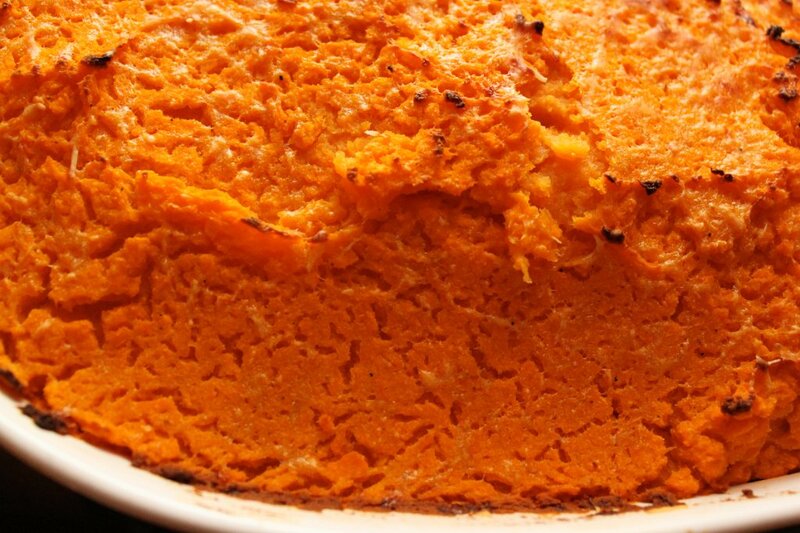 I don’t love sweet potatoes but this looked so yummy so I tried it. And it was DELICIOUS!! 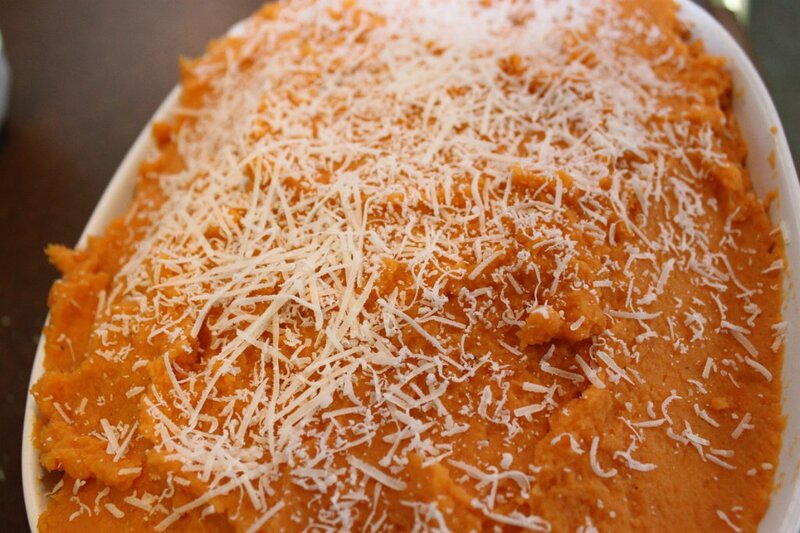 The Parmesan was so good on top of the sweet potatoes and my husband and I gobbled it up! 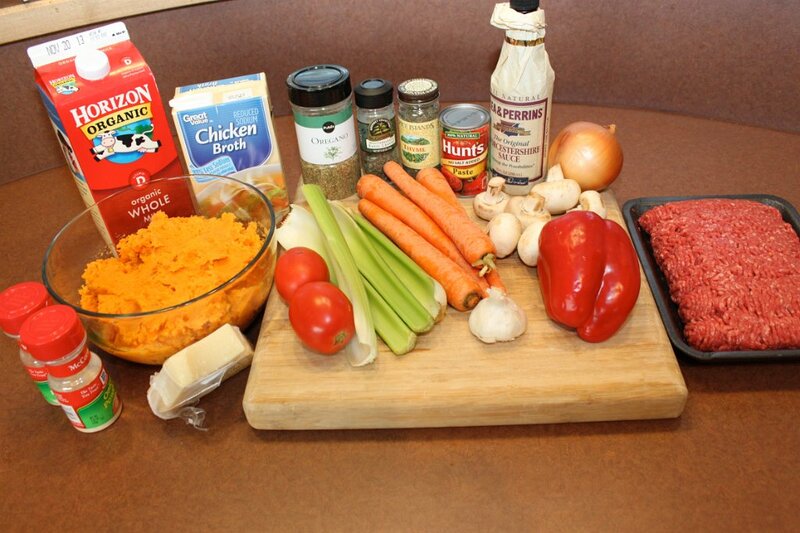 This is the perfect fall meal! 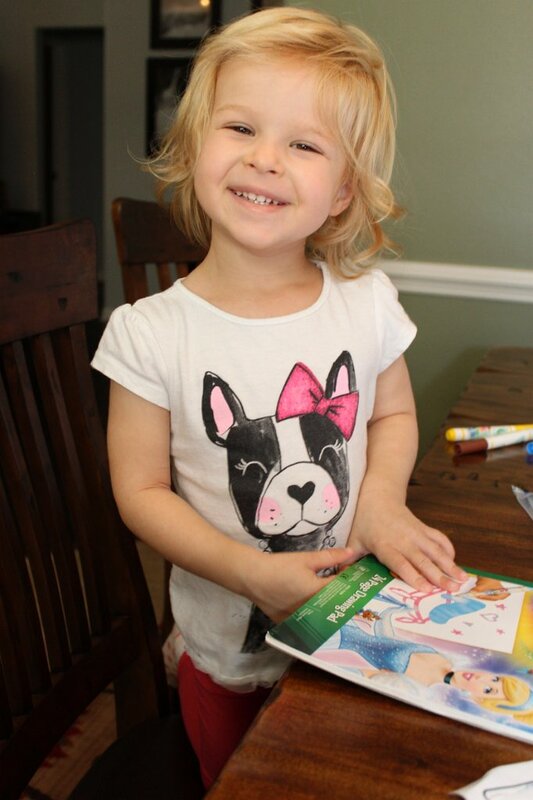 You are so sweet Emily! I love when things like that just work out!